All comments that contain threats will be given to the FBI. I could care less who likes me or who hates me. My blog was not created to make friends. I deal with Jewish History, such as lies against them and ect. I know many of the lies about the Jewish people because I was guilty of much of it myself. My goal is to educate people about the Jewish people from the “Gentile” point of view. As a Christian, I owe much of what I believe and follow to the Jewish people. If that upsets people, then so be it. I have already turned in threats in the past. And for those who don’t know, action has been taken against certain people. And trust me, I don’t mind turning in more people. If people go to jail, so be it. I could care less. You want to make threats, deal with the FBI. I won’t tolerate them. What a shock that the current Catholic Pope supports Muslims and not Israel. For those who don’t recall, the Catholic “Church” and Pope also supported Hitler and Nazi Germany while millions of Jews were driven from their homes to suffer and die. Speaking in Bethlehem, where he delivered his most sensitive speech yet of an eight-day tour of the Holy Land, Benedict XVI acknowledged the suffering of the Palestinian people following the establishment of Israel in 1948. But he also urged moderation, telling Palestinians they should not use violence to further their cause. Speaking later at the Aida refugee camp, he criticised the concrete security wall “towering over us”, saying it was “tragic” to see barriers erected between the two communities. The Pope, who also celebrated mass in Manger Square in front of the ancient Church of the Nativity, believed to mark the birthplace of Jesus, sent a message of solidarity with moderate Palestinians such as Mahmoud Abbas, the Fatah leader and president of the Palestinian national authority, when he gave his support to proposals for a “two-state solution”. “The Holy See supports the right of your people to a sovereign Palestinian homeland in the land of your forefathers, secure and at peace with its neighbours, within internationally recognised borders,” the Pope said. “I know how much you have suffered and continue to suffer as a result of the turmoil that has afflicted this land for decades,” the Pope said. In remarks aimed at the many militant groups within the Palestinian community, the Pope said they should “resist temptations to resort to acts of violence”. Israel was nominally behind the two-state plan until the recent election of a Right-wing government led by Benjamin Netanyahu which has said it is reviewing its position on the issue. The Pope is due to meet the Israeli prime minister on Thursday. 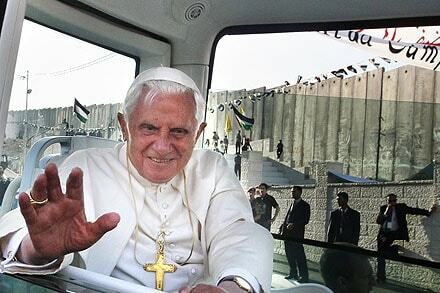 After two days in Israel the Pope had to cross into the occupied West Bank where Bethlehem is located. This meant he had to pass through the 10-yard-high concrete wall built by Israel around Bethlehem. Deemed illegal under international law, Israel has nevertheless pressed on with its construction on the grounds that it deters suicide bombings and other security threats. In the afternoon he spoke at the Aida refugee camp, one of several housing Palestinian families driven from their homes through the creation of Israel in the second half of the 20th century. Israel had forced the organisers of the event at Aida to move the stage so it would not be dominated by the security wall but this did not stop the pontiff criticising the barrier. “Towering over us … is a stark reminder of the stalemate that relations between Israelis and Palestinians seem to have reached – the wall,” the Pope said. Speaking after his visit, he issued a message of hope. “I have seen, adjoining the camp and overshadowing much of Bethlehem, the wall that intrudes into your territories, separating neighbours and dividing families,” he said. There appears to be a growing number of racist incidents against blacks that civil rights groups in Dallas are attributing to white supremacist groups. We’ve heard reports of a white supremacist group setting up an office or residence in South Dallas, of all places. Yesterday, a group gathered at the Old Red Courthouse to draw attention to the distribution of Ku Klux Klan recruitment fliers being distributed in Forney and racial and sexual graffiti being placed on a church bus in Bedford. Well, Forrest Lee, imperial klazik and spokesman for the regional Klan, wants to make it clear that his group is no longer the bunch of supremacist thugs who engaged in midnight lynchings, cross-burnings, kidnappings and other terrorist activities across the South. I’m amazed this group still exists legally, with its own spokesman and phone number and everything. It’s as if this nation has a double standard on terrorism. If the terrorist group conducted its activities against an oppressed racial minority, then it’s all right. But if it conducts its activities against establishment people in business suits in big buildings, that’s bad. With Swine flu spreading and taking it’s first American life; God was right, Swine is unclean. I myself trust the God of Israel and I always take his advice. He said swine was unclean and well, I agree with Him 100%. This doesn’t shock me. Millions of us Gentiles disobey God daily and eat unclean animals. Churches even lead the way by misquoting what Paul actually taught and by lying about what Christ taught. We as people deserve this. When you mock God, see what happens? When wild inhabited the woods. Psalms 80:13 The boar out of the wood doth waste it, and the wild beast of the field doth devour it. Unclean and not to be eaten. Leviticus 11:7-8 And the swine, though he divide the hoof, and be clovenfooted, yet he cheweth not the cud; he is unclean to you. Of their flesh shall ye not eat, and their carcase shall ye not touch; they are unclean to you. 2 Peter 2:22 But it is happened unto them according to the true proverb, The dog is turned to his own vomit again; and the sow that was washed to her wallowing in the mire. Luke 15:16 And he would fain have filled his belly with the husks that the swine did eat: and no man gave unto him. Isaiah 66:3 He that killeth an ox is as if he slew a man; he that sacrificeth a lamb, as if he cut off a dog’s neck; he that offereth an oblation, as if he offered swine’s blood; he that burneth incense, as if he blessed an idol. Yea, they have chosen their own ways, and their soul delighteth in their abominations. Matthew 8:30 And there was a good way off from them an herd of many swine feeding. Herding of, considered as the greatest degradation to a Jew. Luke 15:15 And he went and joined himself to a citizen of that country; and he sent him into his fields to feed swine. The Gergesenes punished for having. Matthew 8:31-32 So the devils besought him, saying, If thou cast us out, suffer us to go away into the herd of swine. And he said unto them, Go. And when they were come out, they went into the herd of swine: and, behold, the whole herd of swine ran violently down a steep place into the sea, and perished in the waters. The ungodly Jews condemned for eating. Isaiah 66:17 They that sanctify themselves, and purify themselves in the gardens behind one tree in the midst, eating swine’s flesh, and the abomination, and the mouse, shall be consumed together, saith the LORD. The United States, several European nations and Israel suspect that Tehran has been trying to acquire the capacity to build nuclear weapons, but Iran says its nuclear program is solely for peaceful purposes. Last month, the Washington-based Institute for Science and International Security released a report saying that Iran has reached “nuclear weapons breakout capability” — it has enough uranium to make a nuclear bomb. Happy Easter? Never, Easter is a Pagan ritual, enough said! Sad millions of Christians are out giving thanks to a Pagan ritual today. Easter was, and always will be a Pagan day of worship.